When I think of fall recipes, I think of comfort food. 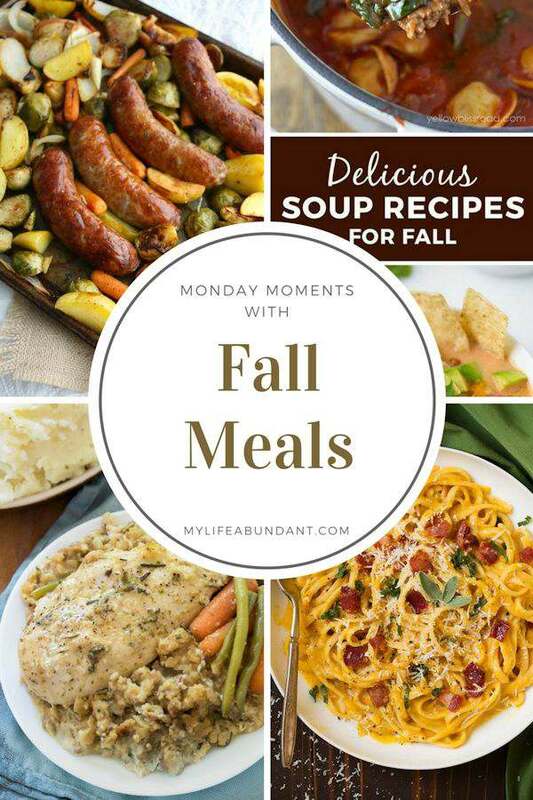 Meals that make me all warm inside to help me tackle what ever fall throws at me. There are so many activities we all do during the fall, that we need meals that will fill us up and not wanting to a snack an hour later. Here are a few I found I plan on trying this fall. There are so many areas which celebrate Octoberfest and here is a perfect meal to serve then by Grab a Plate. Its cooked on a sheet pan for an easy planned meal. Did someone say soups? To me, soups are the best meals to make during the fall and winter. They are economical, will feed many and just good to eat. Here is a list of 15 soup recipes by Little Things. Fall also means some form of stuffing and Crock Pot Chicken and Stuffing looks so easy to make by The Cozy Cook. Oh my this looks good and made with simple ingredients. I must try this recipe by Cooking Classy. It looks just like fall and I love butternut squash. I know prep work for a butternut squash can be a little daunting, but the rewards are so worth it.